Restored from the deleted site. Originally posted on November 15, 2013. I’ve been noticing the intonation of my ukulele is a bit off. Intonation is the tuning accuracy of strings going up the fret board. So a string can be in tune when open, but at some point up the fret board it stops being in tune. This can make chords played higher up the neck sound bad. Strangely, two of the strings on my ukulele (1st and 3rd) are sharp at the 12th fret, while the other two are right on. It didn’t used to be like this, so I figure the change is caused either by the strings being old or that the wood is responding to the drier weather (November in New England). 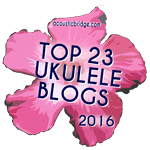 Either way, a post on Ukulele Underground about intonation suggested relative tuning as a solution to intonation difference between strings. I tuned my guitar by ear for 25 years but for some reason everyone in the ukulele community seems to use tuners. I started using an app on my phone to tune my ukulele and haven’t questioned it until now. Tuning by ear is the idea of tuning a single open string to some reference (like a tuner or a piano). Then tune all the other strings to each other by fretting strings to play the same note as another open string. Rather than reinvent the wheel, here are detailed instructions for doing this: Tuning the ukulele to itself. The thinking goes like this: If you use a tuner you’re tuning the open strings. Unless your intonation is perfect, your ukulele will only really be in tune if you play open strings. By tuning relative to other fretted strings you’re taking into consideration the subtle differences in intonation across each string. The effect is that neither open nor fretted is perfectly in tune, but unless your intonation is way off, both should be close enough to sound in tune to the average ear. Sure enough, I tuned my ukulele by ear and I can now play up and down the neck without it sounding out of tune. It doesn’t sound perfectly in tune, but it isn’t offensive either. And even if you’re intonation is great, it’s probably not perfect. Tuning by ear is a win either way.